When you buy your vintage style short wedding dress it opens up all possibilities on what wedding shoes you can wear. Shoes for short wedding dresses can come in any height and even a mid wedding shoe change is easy. Wearing a short wedding dress allows you to choose what you like rather than be dictated to depending on the hem length of your dress. 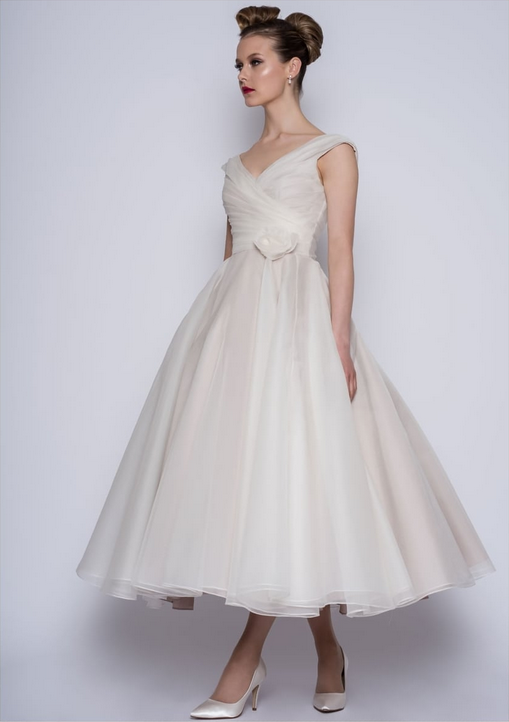 Amelie is a beautiful vintage inspired 50’s length silk organza dress with pleated bodice and full circle skirt. Calf length dresses are perfect for any height of heel you may go for and works equally well with flats too. So choosing statement heels on your wedding day to complete your look is easy and fun. Lots of brides choose retro inspired heels that match their retro short wedding dresses. With many shoe designers creating modern versions of classic shoe shapes but with a twist. We are also stockists of Rachel Simpson shoes and you can find out more when you come for your one to one appointment. Their classic styles and signature looks come in a variety of colours. Perfect for showing off with a tea length wedding dress. If you love heels but don’t want to be wearing them all day at your wedding, why not change into flats. This is why a short wedding dress is the best choice, you can change your shoes as many times as you like throughout the day. Not having to worry if your dress will become too long or them hem will drag on the floor. You are free to spin your way around the dance floor and have as much fun as you like. Even wearing one of our in-house exclusive designer short wedding dresses by Timeless Chic will work. Olivia has a dropped hem at the back which creates a train so even if you change to flats or trainers, there is no danger of tripping on your dress hem. Olivia is hand crafted in beautiful lace with a polka dot tulle full 1950s style skirt and you can add petticoats to make skirt bigger. Your petticoats can match your shoes or the colour theme for your day to make it even more unique. Many of our real brides change from day into evening and you can see lots more inspiration over on our blog. We showcase real weddings and lots of photographs so you can get more ideas. Don’t forget our Pinterest boards where you will find short wedding dress ideas and shoes for short wedding dresses. Our website has many of our designer short wedding dresses so why not check them out. 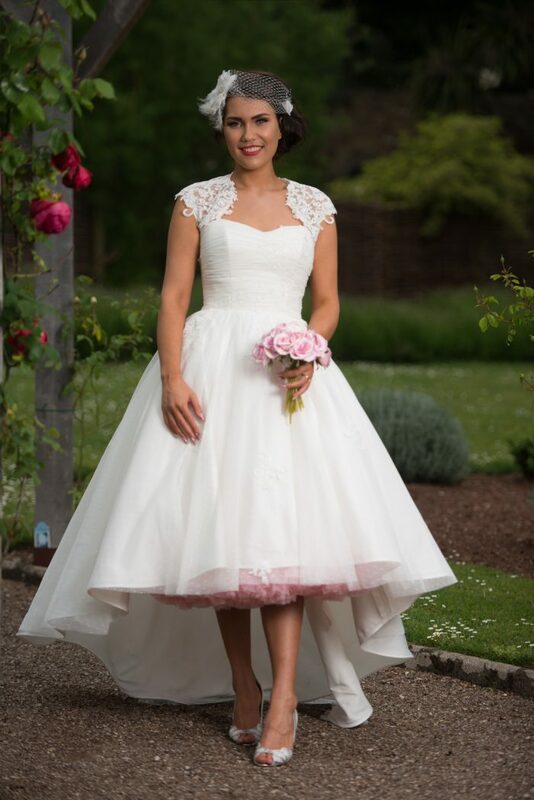 If you are yet to find your perfect short wedding dress then visit us today. Arrange your one to one appointment where you can see the full range of tea length wedding dresses. We also have the perfect shoes for short wedding dresses.